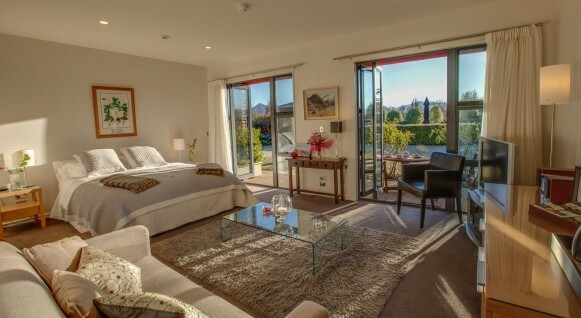 The Linden Suite has a fresh, contemporary feel with the open-plan bedroom and lounge opening out to an expansive veranda and garden area. An outdoor setting provides a relaxing vantage point to take in the alpine views. This suite features a super-king or twin beds and an ensuite bathroom with shower. All rooms provide heated tiled floors, hairdryers, bath robes and slippers, cotton bed linen, fresh flowers, writing desks and telephones. In addition to the guestroom features, this suite provides a private lounge area, tea and coffee making facilities, a fridge stocked with light refreshments.